I have been hand making gifts for a group of girlfriends with whom I exchange small birthday gifts and was wondering what to do this year for the two December birthdays. Last year I gave them earflap hats in brown, pink and cream, an upsized version of the hat I made for Audrey. 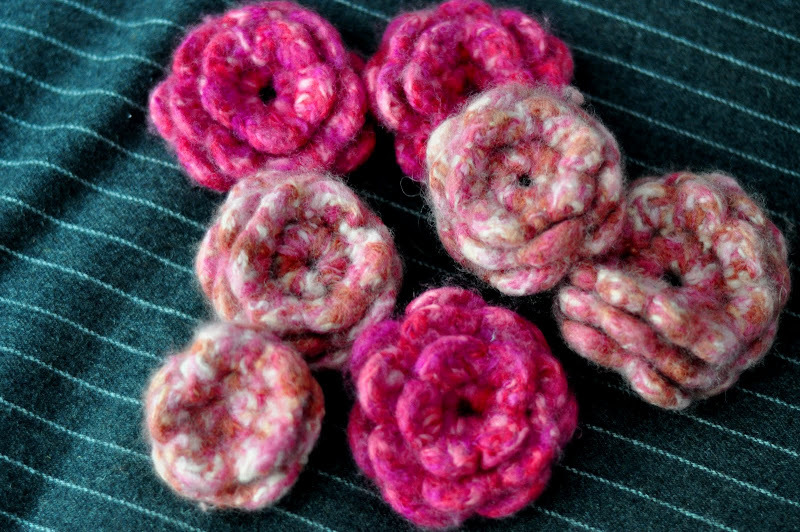 This year I decided to do felted flower corsages--fast and fasionable in my opinion. I made a bunch of these flowers for a crochet dress for Audrey last year and have always thought they'd be cute on their own. I based them on this Crochet Today pattern for the large and altered it to make them a bit smaller--a medium and a small version. Then I sewed on a pin on the back to create a corsage. 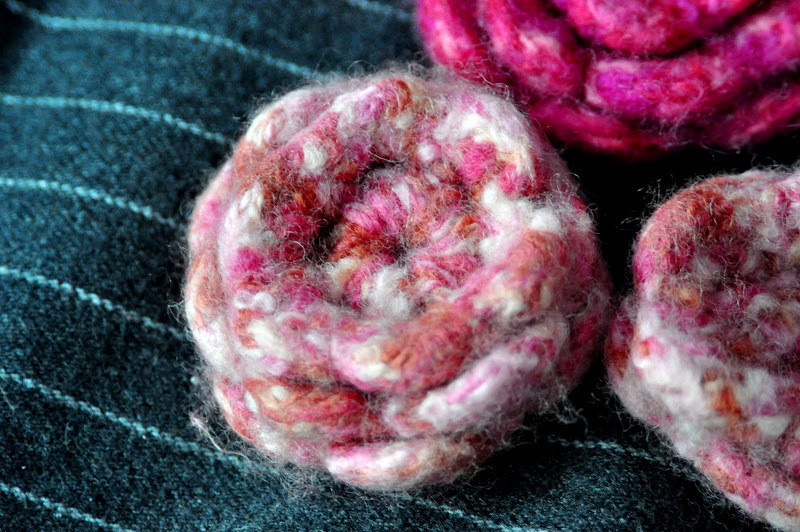 Chain 3, join chain with a slip stitch to form a ring. Round 4: (this is the center row of petals) Working off a round two skipped double crochet, chain 3, *slip stitch in next skipped double crochet, chain 3; repeat from * 5 more times, join round with a slip stitch in firs slip stitch. 7 chain-3 loops. Round 6: (Front row of petals) Chain 2, skip next 2 double crochet, *slip stitch around post of next double crochet, chain 2, skip next 2 double crochet; repeat from * 3 times more, join round with a slip stitch in first slip stitch. 5 chain-2 loops. Round 4: (this is the front row of petals) Working off a round two skipped double crochet, chain 3, *slip stitch in next skipped double crochet, chain 3; repeat from * 3 more times, join round with a slip stitch in firs slip stitch. 5 chain-3 loops. 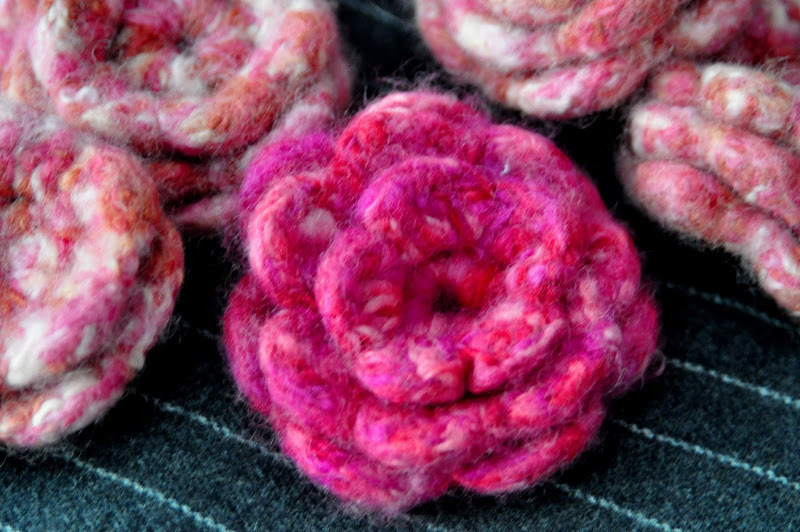 Felting: Place the flower (or flowers) in a pillowcase cover (use zippered cover or close with a rubber band). Fill washing machine to low water setting at a hot temperature. Add about a tablespoon of a detergent such as Woolite and the pillow case. Put on gentle wash cycle. (I use the hot/cold setting). When cycle is complete check the flower. If it is too large put through a second cycle. (I typically like the results I get from two cycles). Remove flower(s). 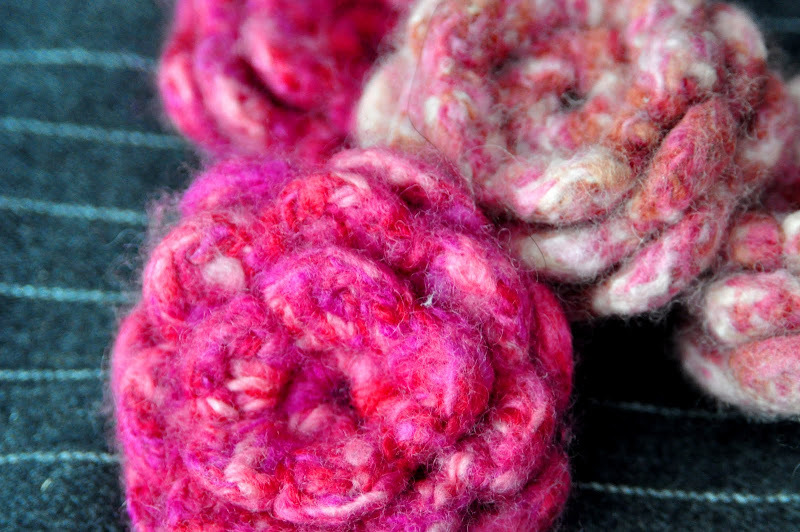 Form flower into shape and allow to air dry. I made a 3 layer flower and it looks awesome. Your pattern was one of the easier ones I found and I am so thankful for that. I do want to make the 3 layer flower a little bit smaller. Any suggestions on how to adjust? These flowers are terrific, love your blog.